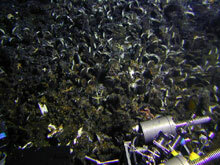 The suction sampler on Pisces V (upper left) vacuums up some orange microbial mat while a probe records the temperature (lower left) at Volcano W. Click image for larger view. After the final dive at Giggenbach Volcano we made one dive on Volcano W. This volcano was discovered last October by the New Zealand research vessel Tangaroa during the  NZAPLUME III (New Zealand American PLUme Mapping Expedition)  cruise. 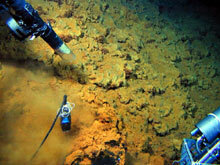 A CTD cast made from the Tangaroa revealed a hydrothermal plume in its southeastern caldera. 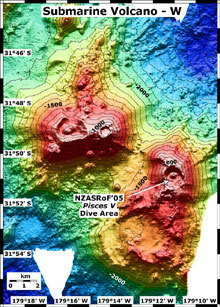 On Dive PV-621 Ian Wright searched for the origin of a hydrothermal plume and conducted geologic mapping of the volcano. 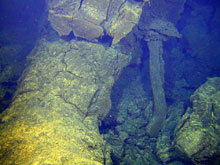 The dive traversed more than 3 kilometers (~1.5 miles) of seafloor and discovered low-level venting in several places. The biology samples included an unusual tube worm that may be new to science. Although Volcano W was an intriguing place, it did not have the intense hydrothermal emissions present on many of the other unexplored volcanos. Tubeworms grow at the base of a rock outcrop that is covered with bivalves at Volcano W. Click image for larger view. Toothpaste-like lava at Volcano W oozed from this tube before it solidified in place. Click image for larger view. An angler fish lies in wait on young lava flows from Volcano W. This species was previously unknown to inhabit in New Zealand waters. Click image for larger view. 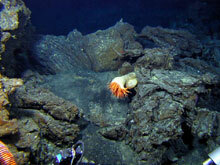 An anemone on relatively young lava flows at Volcano W. Click image for larger view. 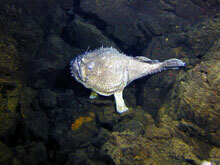 PISCES V made its final dive of Leg I on Rumble V volcano with biologist Malcolm Clark. The submersible landed on a seafloor of young basalt flows festooned with a wide variety of strange oval sea urchins and large branching coral. The sub came upon an extensive field of large mussels that continued upslope. After taking some samples the PISCES V had to return to the surface after only three hours on the bottom, due to rising wind and seas. However, we will be returning to Rumble V on Leg II in search of the source of the intense plume rising off its summit. 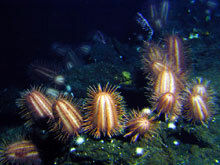 The unique biology observed during Dive 622 has only whetted our appetite for further exploration of Rumble V.
Deepsea urchins (reminiscent of cacti) grow on the lavas at Rumble V volcano. This is the first time that this species has been observed alive on the seafloor. Click image for larger view. Mussels dominate the hydrothermal biological community at Rumble V volcano, just as at all the other volcanoes we have explored during this expedition. 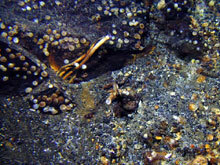 However, the Rumble V mussels are much larger (over a foot long) than found at the other sites. Click image for larger view. 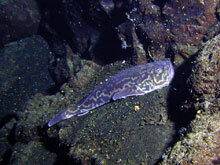 A fish called an armourhead stargazer rests on the seafloor at Rumble V volcano. This sighting, at 770 m, was surprisingly deep for this species. Click image for larger view. 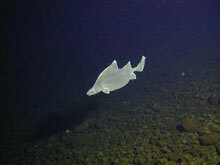 A deepsea shark called a prickly dogfish swims by Pisces V at Rumble V volcano. Click image for larger view.